These ads generate millions of dollar for YouTube and its uploaders on a daily basis . While YouTube viewers are comfortable with text and image ads , in-stream videos ads on the other hand are not preferred by a lot of YouTube users . The same even applies for me . But actually advertisements are a necessary evil . So you should not disable ads on YouTube unless you don’t want to discover new products and services . Officially there are no options to disable advertisements on YouTube videos , unless the uploader of the videos has not opted in for the revenue sharing program or disabled advertisements on his/her videos . 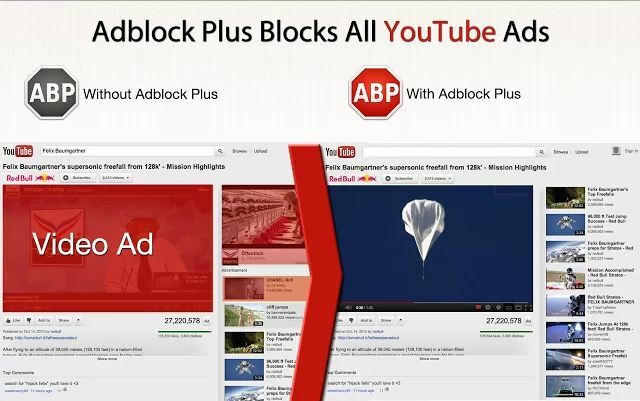 But unofficially you can remove videos from YouTube ads by simply installing the Adblock plus extensions in web browser . Download and install Adblock from the links below for your respective web browser and you will be able to remove ads from all videos across YouTube , Facebook and many more websites . Download and install the Adblock extension on your browser from the links below and you won’t be ever pestered with those irritating ads again on YouTube and any other websites . Once you install the Adblock extension in your web browsers you wont be bothered any more with any pesky advertisements .